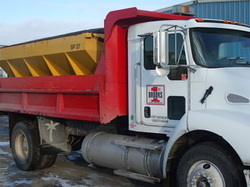 Commercial Snow Removal - Brooks Construction Company, Inc.
Brooks Construction Company offers full snow plowing and salt services for commercial enterprises during the winter months. To ensure service when you want it, we have a dedicated 24 hour phone line dedicated to the snow and salt portion of our company. Our fleet consists of 4 X 4 trucks with plows, salt trucks, loaders, graders, bobcat, and tri-axle and tandem dump trucks. Skilled at maneuvering on working yards and complex lots, our professional drivers are available all hours of the day. please contact either Bill Stevens or Sara Boardman at 260-478-1990.